Every year we celebrate the life of Chris Brown with a tournament played in his memory. Members we kindly as that you bring a contribution of some cake to enjoy with tea! Thank you in advance. Chris was born in Canada and then the family moved to California, returning to England a few years later. When Chris was 7 the family moved to Headstone Gardens, North Harrow, living in the same road as Terry and they became best friends along with the Allen brothers and the Lahiffe brothers. When they were all about 14 and 15 years old they discovered Headstone Tennis Club and this club became the focal point of all their social activities. At first Chris played for the table tennis team but after a year or so he started to play more tennis than table tennis. He loved this club and in fact had his 21st birthday party here. It was very much a part of his life. His life revolved around sport, Arsenal football club and Watford football club. He was very fit, played football, went out jogging most evenings. On the 11th June 1980 he went out for his usual jog, came home early as Arsenal were on television, collapsed in our arms and died within seconds – a freak virus, the doctors said; fluid had touched his heart and there was absolutely nothing anyone could have done. He was 21 years old. The year after he died, his parents Rita and Denis Brown gave a trophy to the Club, in his name. So, for the past 35 years we have had the Chris Brown Trophy Day. 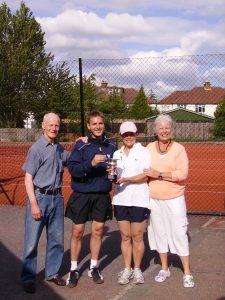 Each year Denis and Rita have presented the trophy to the winners, sadly Denis died 3 years ago but Rita has carried on the tradition. She says it is always an emotional day for her but considers it an honour and a privilege to be a small part of the Club which Chris loved so much and which was very much a part of his teenage years.